My garden furniture has taken some hard use over the last two years. Not having a shed (was broken into and then the roof collapsed) means it's stayed out in the winter. I'm unsure if it's paint or a stain (or other). Plan is to give it a light sand (nib it over as they say this way) and then apply the paint/stain/etc. Is that the right way to go? moved here as not a gardening question. 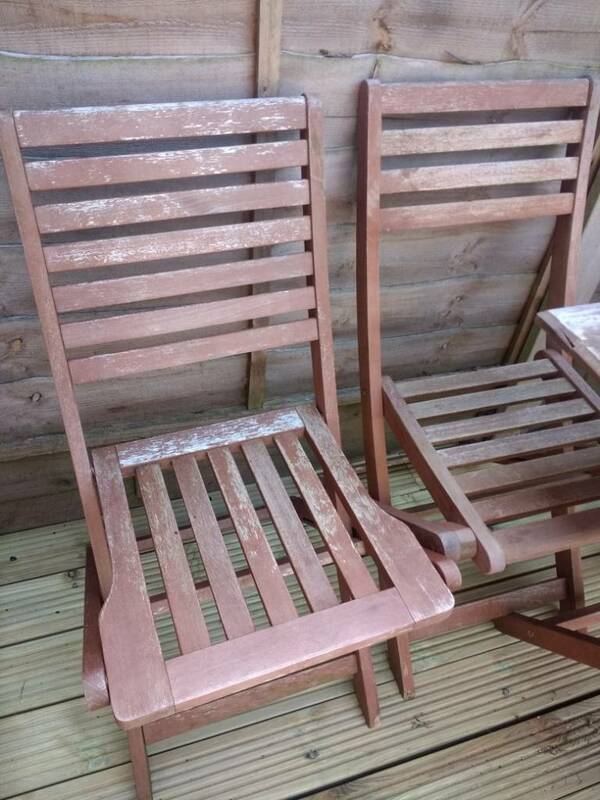 Not wanting to be too pessimistic, but do you realise that each piece of timber has 4 sides, and to do the job properly you will have to sand / treat each surface so that's 36 surfaces just for the back of the first chair, and you have ?4 chairs, not to mention the table, if you have the time (and it will be a lot of time) Then go for it, otherwise I would buy a new shed and new furniture, or just let what you have degrade over time, sad that it is, we changed to "resin" garden furniture years ago as it can sit out side all year round and only needs to be washed as and when. No need to replace, it looks fine. Pressure wash it if you can, otherwise a good wash with a stiff brush and rinse it well. 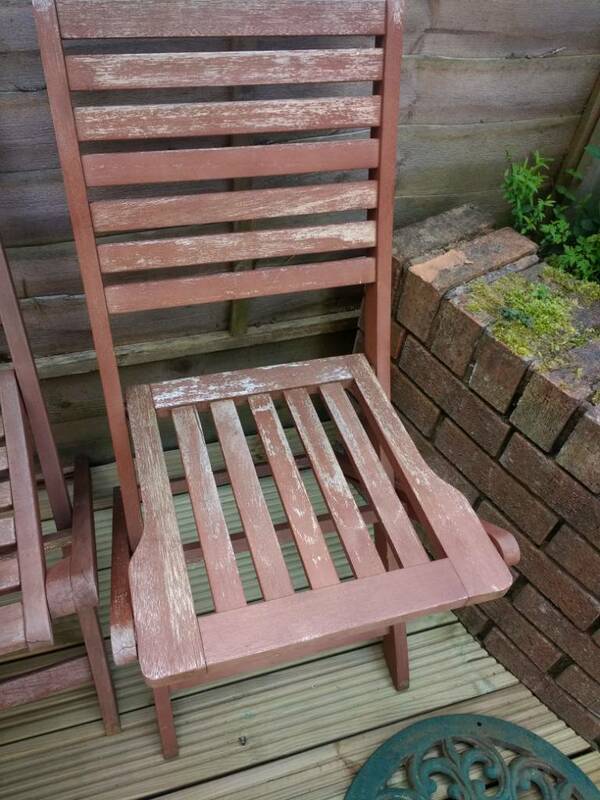 Let it dry in the sun and then apply an oil or stain that is listed as suitable for garden furniture (fence stains don't always dry enough to sit on). Follow the directions on the tin. Only worry about sanding any areas you might be sitting on if there are splinters or sharp edges, otherwise leave them. Remember, it's garden furniture, it doesn't have to look pretty. With a little bit of work and a good solid colour stain you should be able to make them look pretty decent. My 1/2p worth of input is something like. I start from the basis of not using a crust forming paint/varnish/preservative. Instead I would rather use something penetrating (no matron jokes please). So, when it gets weathered again and again no more flacking. I would use an electric sander on the easily accessible flat surfaces, then by hand the visible bits, then 2-3 coats of oil. I won't look pretty as it will still have the old coat of whatever is on it. It will take a while for the old stuff to flake off. If you must paint it with whatever, fair enough but there is little point in trying to bring it back to bare wood. Sooner than later the old "paint" will lift underneath the new coat. 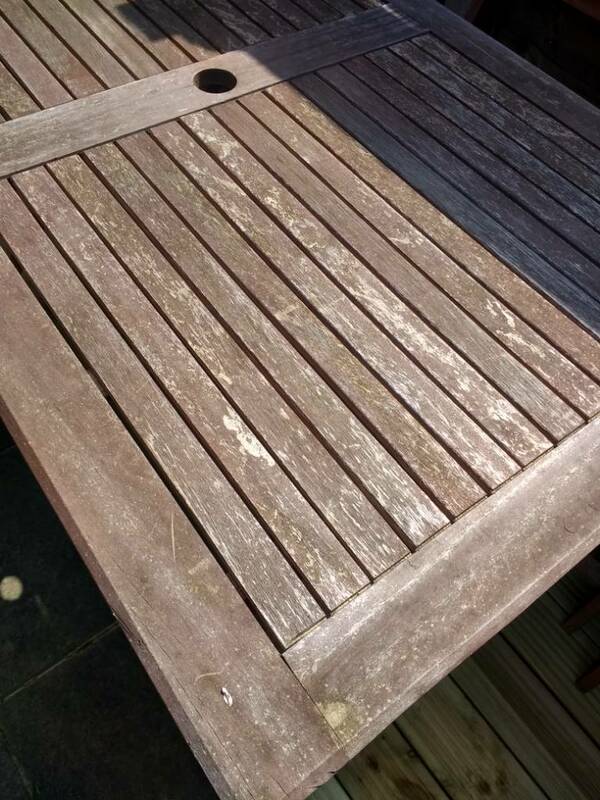 Stripping and re-varnishing garden furniture? Restore a high gloss finish to a stone tile floor?